We present analytical expressions for the 31 five-particle phase-space master integrals in massless QCD as an ϵ-series with coefficients being multiple zeta values of weight up to 12. In addition, we provide computer code for the Monte-Carlo integration in higher dimensions, based on the RAMBO algorithm, that has been used to numerically cross-check the obtained results in 4, 6, and 8 dimensions. On leave of absence from Joint Institute for Nuclear Research, 141980 Dubna, Russia (A. Pikelner). 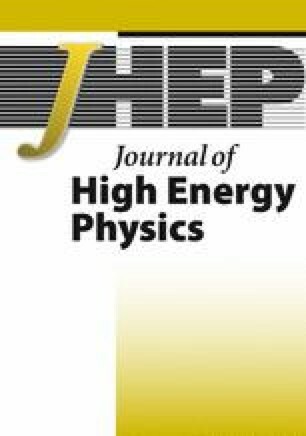 The online version of this article ( https://doi.org/10.1007/JHEP06(2018)099) contains supplementary material, which is available to authorized users. A. Gehrmann-De Ridder, T. Gehrmann and G. Heinrich, Four particle phase space integrals in massless QCD, Nucl. Phys. B 682 (2004) 265 [hep-ph/0311276] [INSPIRE]. R.N. Lee and K.T. Mingulov, DREAM, a program for arbitrary-precision computation of dimensional recurrence relations solutions and its applications, arXiv:1712.05173 [INSPIRE]. A.S. Schwarz, Gauge theories on noncommutative spaces, hep-th/0011261 [INSPIRE]. S. Laporta, High precision calculation of multiloop Feynman integrals by difference equations, Int. J. Mod. Phys. A 15 (2000) 5087 [hep-ph/0102033] [INSPIRE]. B. Ruijl, T. Ueda and J. Vermaseren, FORM version 4.2, arXiv:1707.06453 [INSPIRE]. R.N. Lee, LiteRed 1.4: a powerful tool for reduction of multiloop integrals, J. Phys. Conf. Ser. 523 (2014) 012059 [arXiv:1310.1145] [INSPIRE]. T. Hahn, CUBA: A Library for multidimensional numerical integration, Comput. Phys. Commun. 168 (2005) 78 [hep-ph/0404043] [INSPIRE]. J.C. Collins and J.A.M. Vermaseren, Axodraw Version 2, arXiv:1606.01177 [INSPIRE].